The electoral commission declared Putin the victor with 63.7% of the votes with nearly 100% of the ballots counted. But Putin's opponents refused to recognise the results and said they would press ahead with the biggest protests since he rose to power 12 years ago. But the former KGB spy said he had won a "clean" victory and was on course to return to the Kremlin after four years as prime minister. "I promised you we would win. We have won. Glory to Russia," Putin, dressed in an anorak and flanked by outgoing President Dmitry Medvedev, told tens of thousands of flag-waving supporters at a late-evening victory rally under the red walls of the Kremlin. Denouncing attempts to "destroy Russia's statehood and usurp power", he said: "The Russian people have shown today that such scenarios will not succeed in our land … They shall not pass!" The crowd at one point chanted: "Putin! Putin! Putin!" Some danced to keep warm and drank vodka from plastic glasses, with empty bottles crunching underfoot. It was a defiant and angry speech which left Putin, 59, on collision course with the mainly middle-class protestors in Moscow and other big cities who have staged huge rallies since a disputed parliamentary poll on 4 December. His nearest rival, Communist Party leader Gennady Zyuganov, had about 17% of votes, and nationalist Vladimir Zhirinovsky, former parliamentary speaker Sergei Mironov and billionaire Mikhail Prokhorov were all below 10%, although Prokhorov won plaudits for his campaign. Zyuganov said his party would not recognise the result and called the election "illegitimate, dishonest and untransparent". Liberal leader Vladimir Ryzhkov also said it was not legitimate. The protest organisers, who see Putin as an autocratic leader whose return to power will stymie hope of economic and political reforms, said their demonstrations would now grow. Thousands of opposition activists as well as an international observer mission monitored the polls. Vote monitors from the opposition and bloggers posted allegations of election rigging across the country of 143 million. Golos, an independent monitoring group, said it had registered at least 3,500 reports of violations nationwide. Despite the opposition, mainly among well-educated and relatively well-off young professionals, Putin's support remains strong in the provinces and his victory had not been in doubt. He showed his gratitude in late-night video links with supporters around Russia, including workers at a tank factory in the Urals town of Nizhny Tagil who have denounced the protests. "You put in their places those people who went one step too far and insulted the working man," Putin told them. "You showed who the Russian people are, the Russian working man, the worker and the engineer. You showed that you are a head higher than any layabout, any old windbag. This was for me the biggest present." 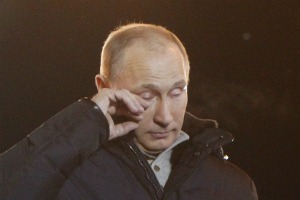 A spokesman later said Putin had wept real tears at the victory rally but said they were caused by the biting wind. But the reaction to his rallying cry at the victory rally was more muted than expected. Hundreds of buses had brought the crowd to Moscow, signalling that it was a well-organised show of force rather than a spontaneous display of support. The mood has shifted in the country and many people are uncertain whether he will be conciliatory and reformist, or stand in the way of political and economic change. Putin, who will be inaugurated in May, is likely to revert to the fighting talk against the West that was the trademark of his first presidency and his election campaign. "They are stealing our votes," said Valentin Gorshun, a patient in Moscow hospital number 19, where more than 90% of votes went to Putin's United Russia party in December. Venezuelan President Hugo Chavez welcomed Putin's victory, AFP reported. In a statement issued by the Venezuelan Foreign Ministry, Chavez called Putin "a driving force behind strategic ties of cooperation between Venezuela and Russia." Chavez underscored "strong ties of friendship" between him and the Russian leader. "Wishing President Putin and his team all the best, the Venezuelan government reaffirms its strong commitment to deepening strategic relations between the two countries," the Foreign Ministry said. Economists say a key test of Putin's return will be how far he is ready to go to reform an economy heavily dependent on energy exports, and caution that his populist campaign spending promises could return to haunt him. "It's a watershed - Russia faces decline and stagnation unless they really kick-start reforms, and push forward an ambitious reform agenda," said Tim Ash, head of emerging markets research at Royal Bank of Scotland in London. The President of the European Parliament, Martin Schulz, expressed his concern about "the lack of fairness" in the latest Russian elections "notably with regards to a limited choice of candidates and irregularities in the procedure." "I regret that candidates did not have equal access to media and state resources. Most of the media clearly favoured one candidate." "I welcome the reawakening of civil activism in Russia, which was clearly visible at peaceful countrywide protests during the campaign. They showed that the Russian people expect full democratic rights to be able to determine the future of their country." "Vladimir Putin's victory was just as expected as the discontent of the opposition. But two new details emerged - a victory of regions over the capital, meaning that the capital became the centre on the criticism on Putin, and the emotional outbreak of the new President. It hardly was a planned move. Building on his officer past, Putin's self-control was flawless. However, presidents also sometimes allowed to display weakness. The reason is in the wind of change. From now on, Putin will probably try to be more oriented toward the regions, his electoral base, and take some distance with the "middle" class from big cities like Moscow. At the same time, we should welcome the fact that protest in capitol showed that the civil society exists in Moscow." Vladimir Putin - president from 2000-2008 - has remained Russia's dominant leader and its most popular politician since stepping aside in 2008 to make way for his ally, Dmitry Medvedev, because he was barred from a third straight term by the constitution. Putin has served as prime minister since. First channel, Russian television:? ????? ?. ?????? ????????? ???????????? ?? ??????????? ?????????? Rossiyskaya Gazeta:??? ??????? ?????? ??????????? ABC News:Is Putin's victory legitimate?